SAN MATEO, Calif (CN) – California lawmakers approved using taxpayer funds to gain public access to a Central Coast beach, a direct shot in the fight over a billionaire’s closure of the stretch of popular coastline. Senate Bill 42, co-written by state Sen. Jerry Hill, D-San Mateo, creates a subaccount within the California State Lands Commission’s budget that can be used to pay for portions of a public right-of-way from Highway 1 to Martins Beach, a popular and scenic destination about 7 miles south of Half Moon Bay. The quarter-mile road connecting Highway 1 to the beach is owned by billionaire Vinod Khosla, who also maintains several cabins on a property adjacent to the beach. A co-founder of Sun Microsystems, Khosla bought the property in 2008. He charged people a nominal fee to access the beach for less than a year before he put up a gate with a remote-control lock and painted over the billboard that advertised beach access. 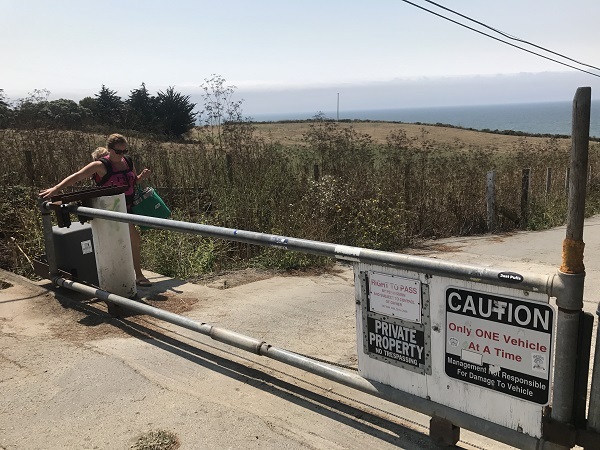 Khosla, owner of Martins Beach LLC, insists he owns the road that leads down to several beachfront cabins and can open and shut the gate at his discretion – something the previous owners of the property had also done. However, several beachgoers who have been using the property for generations say Khosla’s policies are more restrictive and hamper public access. Surfrider Foundation sued Martins Beach LLC, saying closure of the gates required a development permit from the California Coastal Commission and was a violation of the Coastal Act, which mandates public access to the coast. Khosla has continued to defy court orders and efforts by the state to ensure public access is maintained, prompting the California Legislature to take action through Hill’s bill. The state Senate approved Hill’s bill in May, but the Assembly added several amendments that required approval by senators. The amendments passed in the state Senate on Monday, 28-12. The bill will create a sub-account in the lands commission’s Kapiloff Fund, which can be used to pay for environmental analyses related to the creation of a public right-of-way to Martins Beach. The account may accept money from the public, nonprofits and other government entities like San Mateo County, which has indicated it will contribute to the fund. The bill also authorizes up to $1 million in state funds, but stipulates that other money must be spent first. The lands commission has appraised the 6.4-acre right of way at $360,000, but Kholsa said he will sell it for nothing less than $30 million – about $2.5 million less than what the billionaire paid for the entire property in 2008. California Gov. Jerry Brown has until Oct. 15 to act on SB 42 and other bills passed this legislative session.